First things first, do NOT change how you are already designing websites! Designers please continue making your fixed sized designs in Photoshop. This is the best way to get started. Once your design is ready, slice and dice it as usual. Set up your grid layout, get your fonts right, etc… Once you’re done that, a few subtle changes need to happen to make it responsive. The first thing is removing those pixels and replacing them with percentages. 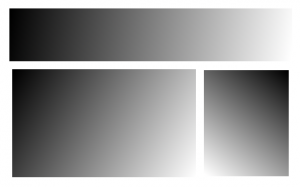 The above picture is a pretty basic grid; it contains a header that spans the full length and two boxes below, one slightly larger than the other. This grid will work perfectly on the desktop; however, if you look it on a mobile device or even just resize your browser, you will quickly notice that left and right scrollbars start appearing. Using the above CSS, as you resize your browser you will see that our grid automatically adjusts to make the new site and no horizontal scrollbars appear. How did I come up with these numbers? It’s quite simple; I took my pixels and did some math. This covers the most complicated part of responsive design. The next part is dealing with the “left overs”. I like to think of it in 2 different ways. Firstly you need to deal with the smallest of devices and secondly you need to deal with the largest of devices. For the former I typically think of 320 pixels in width (standard iPhone or Android width). And for the latter, I think of desktop PCs or laptops that exceed 1200 pixels in width. In most scenarios your base design should handle well on tablet devices or when the phone is in landscape mode. A few small adjustments might be required, but this needs to be addressed on a case-by-case basis. With the above CSS in place, my sidebar will no longer float left. Instead the content will take the full width of the window and the sidebar will live directly beneath the content. Similarly when dealing with screen sizes larger than 1200 pixels, we have the inverse problem. There is typically too much white space or our content stretches so far that as the reader attempts to transition back to a new line it’s easy for them to lose their place. This of course is not the only option, if you are in a situation like my current blog is and it’s not easy to make a third grid item, I instead played around with the 90% that I used above in the outer grid size. Instead I reduced it something more reasonable like 70% allowing more whitespace on the outside of the grid. The bottom line I want to reinforce in this article is that responsive design is not hard, but it does require additional thought. As I am not a designer, I truly don’t have all the answers, but I can help you pose the right questions. These and other questions simply need answering and by using media queries and making several minor adjustments your website will begin to scale smoothly and easily.